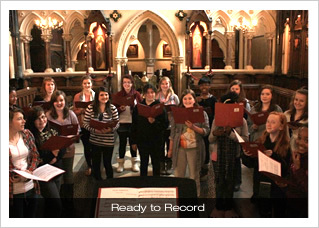 Over the last three days the girls have been working hard recording their next CD - OMNIS GLORIA – which will be launched on Thursday 23 June after the 6:00pm Solemn Choral Mass for the Solemnity of Corpus Christi. 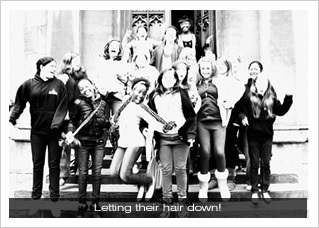 The girls travelled over to Oxford to record the disc in the stunning chapel at Exeter College, Oxford, where there is an authentic French organ. This disc is intended as a follow-on to the hugely successful disc of 2004, En Prière, and again features music by French composers for upper-voices and organ, include many choral rarities by composers such as Chaminade, Charpentier, Duruflé, Grovlez, Lalouette, Nivers and de Séverac. 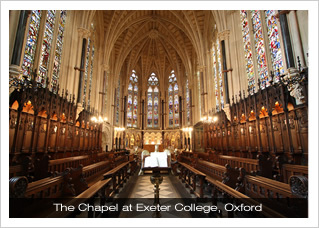 We were lucky enough that Stephen Meakins, a former Organ Scholar who has just finished his studies at The Royal College of Music was able to accompany us, and the recording engineers and producers were Lance Andrews and Richard Tanner, Director of Music at All Saints from 1993 to 1998, when he left to take up the position as Organist and Director of Music at Blackburn Cathedral, and now Director of Music at the Royal Naval College in Greenwich.